William and Joseph Pepitone are brothers and writing partners, having published their first novel while working on several projects in film and literature. William is a retired New York City Police Officer turned author, while Joseph is an Emmy Award winning writer/producer based in New York City. Joe Pepitone had it all. God given ability, leading man charisma, and an ego the size of Brooklyn. Yet throughout the course of his lifetime he threw away a potential Hall of Fame career, two marriages, and countless opportunities. Then one night, rock bottom hit him like a one hundred mile an hour fastball....the wrong place, the wrong car, and perhaps the last wrong turn of his life. Alone in a cold prison cell, the roar of Yankee Stadium a distant memory, Joe is visited by an apparition...a vision of a man who claims to know the path to redemption. They will embark on a wild ride through the peaks and valleys of Joe's life, in a last ditch attempt to right the wrongs. Along the way they will encounter the most serious threat to Joe's eternal existence...the greatest icon in the history of the game. 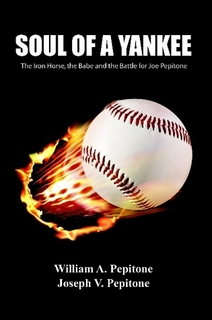 A rivalry dating back sixty years has come full circle, and now each man has something to lose...in the battle for Joe Pepitone's soul. Two of baseballs greatest icons, Lou Gehrig and Babe Ruth, wage an epic clash of the titans as they do battle over the soul of one of the wildest and most popular ballplayers of his time, Joe Pepitone.